Japan's location in the Ring of Fire—a highly volcanic, tectonically active region of the Pacific—means that it's a country that sees a lot of earthquakes throughout the year. This can be surprising if you're from a country that isn't prone to earthquakes, and it's important to be prepared—which is why we've put together this handy guide! Before we get into how to prepare for earthquakes, let's go over what they actually are. It's gonna get a little tec-nical (pun intended! ), but it's important to know. 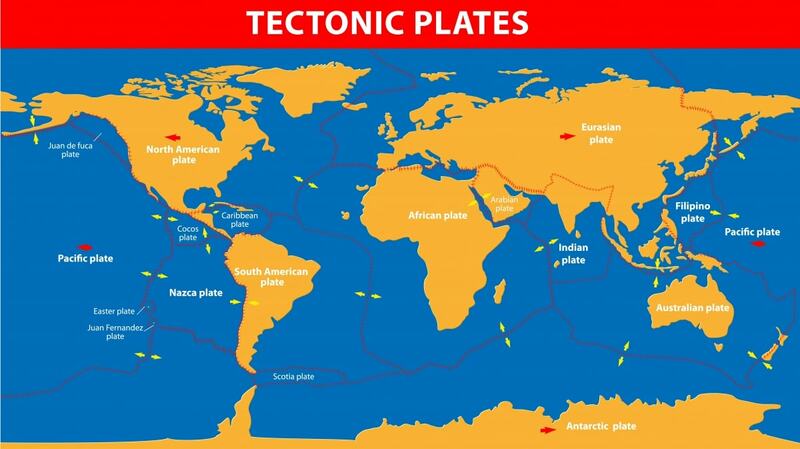 If you can remember your old Earth science classes, you're probably aware that the movement of tectonic plates (pieces of the Earth's crust and upper mantle) is a major cause of earthquakes. There are seven major plates, many minor plates and also microplates. These plates are in motion, albeit quite slow motion, and the type of motion between plates are split into three different types of boundaries. There are convergent plate boundaries, where one or more plates collide into each other, and one eventually slides under the other(s). Then there's divergent plate boundaries, where plates pull away from each other and creates rifts (that are often filled by molten lava!). Finally, there are transform plate boundaries, which are plates that rub against each other horizontally. Regardless of the type, the motion at these boundaries creates a lot of strain, and a lot of energy! This energy is released along faults, which are cracks in the Earth's crust, and that released energy is the cause of most earthquakes. When this energy is released below or near the ocean—which surrounds the Japanese archipelago—they can also trigger tsunami, or tidal waves. So how does all of that affect Japan? Well, of those aforementioned major plates, Japan is located on top of two of them, and there are another two nearby. Most of northern Japan sits on the North American plate, while the south is mostly above the Eurasian plate. Nearby are the Pacific plate and the Philippine plate. These make up part of the Ring of Fire, a large area of the Pacific Ocean that is home to some 90 percent of the world’s earthquakes. According to the Japan Meteorological Agency, Japan has an estimated yearly average of some 150,000 earthquakes a year! Most of those are quite weak (some so small that people don't really notice), but occasionally they aren't. Take, for example, the Great East Japan Earthquake on March 11, 2011. This incredibly powerful quake was caused by a convergent boundary; the Pacific Plate moved underneath the North American Plate, and the North American Plate was forced upward. Beyond the immediate devastation caused by the quake and the resultant tsunami, the force was so big that it accelerated the Earth’s spin, shortening the day by 1.8 microseconds, according to Richard Gross at NASA's Jet Propulsion Laboratory in Pasadena, California. Furthermore, the movement of the North American Plate has been responsible for many of Japan’s earthquakes in the past few decades, and has been moving an astonishing 3.5 inches per year. Of course, it isn't all bad news. Japan's location in a highly volcanic region is also the reason that there are so many incredible onsen throughout the country, and why the landscape is so diverse and beautiful. Plus, Japan has made incredible strides in engineering when it comes to creating earthquake resistant infrastructure and buildings. The government has set very strict standards for seismic resistance, and buildings are either retrofitted to conform to those standards, or built to them from the start of construction. Buildings are classified as structures with anti-seismic systems, structures with damping systems or structures that are seismically isolated. A great example of their engineering ingenuity is the iconic Tokyo Skytree, which was constructed with a central pillar of reinforced concrete and a tuned mass damper that can absorb up to 50 percent of energy generated by quakes. While we're on the topic of energy generated by quakes, why don't we take a look at how earthquakes in Japan are measured? There are two major ways to measure earthquakes—magnitude, and seismic intensity. Magnitude is the scientific measurement of the power of an earthquake at its source, where seismic intensity is measurement of how an earthquake feels, and the observable effects that accompany an earthquake. There are numerous intensity scales used around the globe, but Japan uses the JMA Seismic Intensity Scale, also called shindo. Shindo ranges from 0 to 7, where 0 is imperceptible to most people and only recorded by equipment, and 7 is incredibly intense and potentially destructive. As you can see from the diagram, the higher intensities are also further delineated for even greater specificity. One of the unique aspects of of measuring using an intensity scale is that depending on conditions (such as whether or not you're indoors or outdoors, if you're on a hill or near the ocean, etc. ), the same earthquake can have different measurements, even in the same location. This might make seismic intensity seem a bit arbitrary, but in some ways it is a more meaningful measurement, since it corresponds with the effects people actually experience in the event of an earthquake. Now that we know what earthquakes are and how they're measured, let's look at how we can prepare for one, and appropriate ways to respond depending on where you are when an earthquake occurs. If you plan on staying in Japan for a substantial length of time, we highly recommend that you put together a preparedness kit in case of an earthquake, typhoon, or any other inclement weather. Here are recommended items for a preparedness kit, as suggested by Ready.gov and the Tokyo Metropolitan Government. ・Water: One gallon of water (about four liters) per person per day, for at least three days. Keep in mind that it will be used for both hydration and sanitation. ・Food: A three-day supply of non-perishable food per person. ・Can Opener: Manual, of course. ・Flashlight: Preferably one that is self-powered. ・Batteries: Both dry cell batteries and rechargeable batteries for devices, like your phone. ・Sanitation Supplies: Wet wipes, feminine hygiene products, toothbrushes, etc. The list can go on, and obviously varies depending on your circumstances, but that's a great start. This particular section is geared more toward residents and long-term visitors, but emergency kits can be important for travelers, too. In a pinch, you can easily put one together using items from a ¥100 shop. Plus, snacks and other souvenirs can double as useful items in an emergency as well! If you don't feel like going through the trouble of putting a preparedness kit on your own, you can always pick up a ready-made one as well. Since you've got everything you need in case of emergency, we'll move on to safety tips for when an earthquake occurs. First, let's outline the main points regarding what you should do if you feel a strong earthquake indoors. If you start to feel an earthquake, whether indoors or outdoors, the most important thing is to stay calm and cover your head. 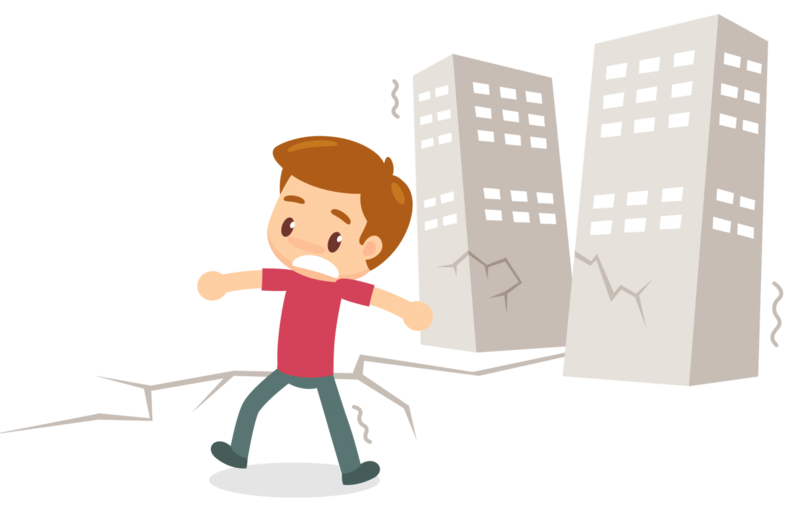 One of the main concerns during an earthquake is that things can fall and cause injury, so avoid going near glass or unstable objects and take cover under the nearest table or sturdy piece of furniture. If there is nowhere to protect yourself, cover your head with something; your bag, a book or even a pillow. If it seems like things are starting to fall, the most important thing is to cover your head and stay still; don't try to rush around, since that's even more dangerous. An important thing to note about homes and apartments in Japan is that many of them use gas to heat water and for stovetops. You don't need to worry about turning off your gas in an earthquake—it'll turn off automatically. Stay in your safe place under a table away from falling objects until the shaking has stopped. Once the shaking has stopped, you can evacuate the building using the stairs. Do not use elevators during an earthquake, as they may lose power. Many of these safety tips are the same as earthquakes indoors, but with some key additions. Let's take a look. As with indoors, first and foremost you must stay calm and cover your head. If you’re in a major city or surrounded by buildings, it's best to go into the nearest, newest building and take cover. If you're in a more remote location, then stay in the most open space available and avoid buildings and cars. Some areas are also prone to landslides, such as hills, so try your best to stay away from them too. Tsunami can hit near coastal areas, and even riversides can be affected. If you're near a large body of water when you start to feel an earthquake, be sure to get to high ground as quickly as possible. Finding higher ground should take priority over getting further away. Tsunami waves are also known for hitting repeatedly, so do not approach the water. When the tremors have stopped, seek shelter. If you are traveling with family or friends, each time you visit somewhere new, make sure you have a meeting point in case you get separated. Please note that basically everywhere in Japan has designated emergency evacuation areas. If you're staying somewhere longterm, try to scope them out. If you're in an unfamiliar area, a good bet is a place with large open areas, like schools or parks. Getting from A to B in a foreign country is the time you are most likely to panic when an earthquake hits. Just remember to stay calm and follow these tips. If you’re in an elevator when the earthquake begins, press every button and get out at the next floor. If you are stuck, press the call button. Failing that, use your cellphone to call 119, the number for emergency services in Japan. If you’re on an escalator, remember to always keep a firm grasp on the handrail, whether there is an earthquake or not. If you’re not in that habit, make sure to take a hold of it as soon as you feel any shaking. This is because there is a chance the escalator will stop abruptly, causing a domino-effect of people falling down. Never use escalators or elevators to evacuate during an earthquake! Always use the stairs. If you’re anywhere underground—like in the subway, a shopping mall, a tunnel or an underground passageway—keep away from glass and signboards. Again, it is always best to shield your head with your bag or anything on hand. Stick to the walls and walk to the nearest exit, and don’t panic. If there is no fire risk, underground facilities are relatively safe, so there is no need to rush. It may even be best to stand still and wait for the tremor to stop if it seems unsafe to move with the crowd. If you’re on a train sitting down, hold your bag tightly and be aware of the people and objects around you. If you’re standing, hold onto the nearest railing or handle, and shield your head. Don’t attempt to leave the train until given instructions. There is a chance that the announcements will not be made in English, in which case, ask someone for help or follow the actions those around you. You can use communication cards via cellphone apps to ask what's going on. Phones bought in Japan automatically receive emergency alerts such as for inclement weather. If you're using a phone from abroad, it's a good idea to download a separate app that will alert you in the event of an emergency, just to be on the safe side. If you can read Japanese, Yahoo’s Y!防災速報 is a good option, as it even creates alerts for high rainfall. If you can’t read Japanese, there are a few good options, such as JNTO's Safety Tips app, or Yurekuru Call, which says it gets early earthquake warnings directly from the JMA. Safety Tips also provides communication cards, emergency contact numbers and heat warnings, among others, and has an accompanying website that you can check out as well.